"Complete Guide to Winter Camping" - Kevin Callan's New Book! Hot off the press and just in time for Christmas time: Kevin Callan's new book: "Complete Guide to Winter Camping" ! This of course is a MUST Have for every winter camper, and will make a great holiday season gift. Get your copy before they sell out! I have my signed autographed copy (Thanks Kevin ), but have not had a chance to read it yet. Leafing through it, its chock full of colour photographs on almost every page, a really nice publishing job. Knowing Kevin's work, its going to be a fun and informative read, and I look forward to reading it through the holidays. Re: "Complete Guide to Winter Camping" - Kevin Callan's New Book! Good news Moondog55: Chapters-Indigo from Canada, where I linked Kevin's book photo from, ships to Australia! "Currently we ship to the following countries: Australia, Belgium, Bermuda, Denmark, Finland, France, Germany, Greece, Ireland, Israel, Italy, Japan, Mexico, New Zealand, Norway, South Africa, Sweden, Switzerland and The United Kingdom". Saw Kevin's You-Tube whiskey chat on his new book yesterday. Seems like he's included a lot of folks we're all familiar with in this book. Readers will see bits of information from Hoop, the fine folks at Lure of the North, Garrett Conover and others. Need to track down a copy and add it to my library. Why do I want to say "more wood!" I have to add this to my library. Good book. Well worth the money. Had it since early November. I feel cheated. Mine isn't autographed. I have looked at a lot of his utube sites. I am wondering if he has camped enough to know he needs a gas stove to get his cooking done without waiting and burning a lot of wood to cook a meal. Does he address the issue in his new book? ...said the guy with a rocket stove and twig heat. Nice troll post. Holly crap.... I didin'T cary a gaz stove in so many years.... I cook on the fire al year round, in the winter I cook on the wood stove in a tent I can stand in at temperature way colder than you probably ever experienced. This have to f****ing stop. Hundreds of people have done it and do it that way and it does work!!! 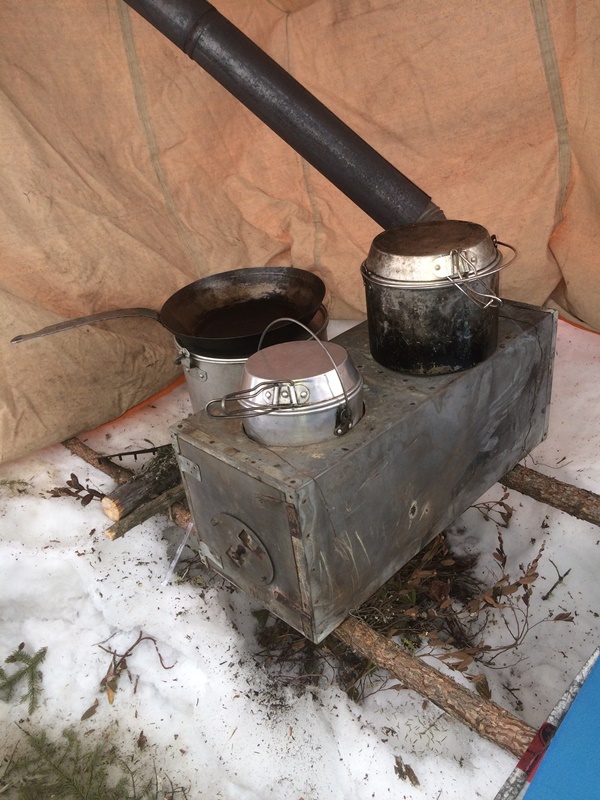 I'm sure your can stove works great for you need, that your tarp pitch with all side tight to the ground work for you and that if you have a bear walking into your camp wile you are cooking in you shelter in the summer time you will(not) be able to spray him by putting your arm out a small hole.... But believe me cooking on a tin stove in a canvas tent does work pretty good, I can bake for 1 to 6 people on it, I boil water at the same time that I cook a meal, I can even keep stuff warm on the side or underneath it wile I have enough water warming up for 4 and cooking a full meal for 4 people wile standing and stretching.... I can keep going, but I think you got the idea! Agree...AND & mewolf1 well said. I do all my cooking on the wood stove. Hi Chimpac, I thought I would post the announcement of Kevin's new book, so that we could all have the opportunity to buy and read it, and maybe provide book reviews in this thread. Maybe you could read it and provide us with a book review. As for me, like ADN and many others, I do not carry a gas stove, and I use wood for all of my cooking and water boiling on the big woodstove surface. I like winter camping in this style, using the abundant firewood around me, and am lucky, and thankful, to be in a place where its legal to gather all the dead standing firewood one needs. My ancestors here have been doing this for about 400 years when sheet metal was first introduced here. Others have landscapes where wood supply is limiting, or maybe gathering firewood is not allowed, and they use gas and liquid fuels to suit their needs. Other folks blend technologies and cook on gas stoves while heating and maybe water boiling on various shapes and sizes of woodstoves to suit their needs. Its all good. I also like hanging around big open fires roasting and drying out, where huge amounts of firewood are burned, and sparks fly up to the clear night sky for the best light show ever. If you have a stove-ring cutout on your woodstove, and can immerse a pot into the flames, you can boil water very, very fast. 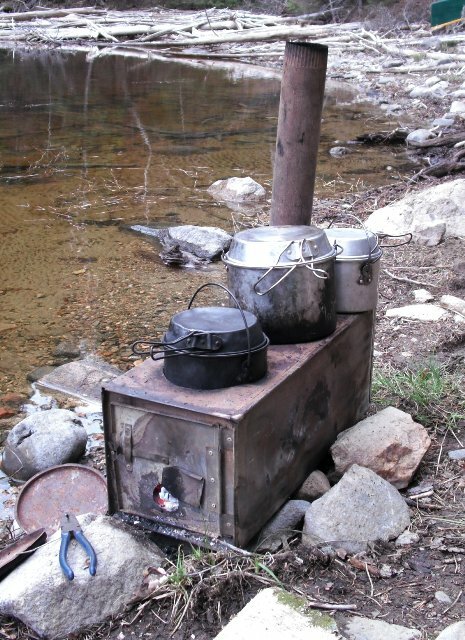 I don't take a gas stove on winter or summer trips, unless it's to an area where wood is not abundant.